Oh NO! I chipped my tooth! Chipping or cracking a tooth can be caused by many things and account for the majority of dental injuries. Maybe you crashed your bike and fell onto the concrete, tripped over your own feet and hit your mouth on the coffee table or maybe you were chewing hard candy, ice or using your teeth to open something or cut fishing line. Whatever the reason, don’t worry, your smile and your tooth can be fixed. It’s important to fix a chipped or broken tooth as soon as it occurs to ensure it doesn’t cause additional problems and increase costs down the road. So, what are your options for fixing the damage? At McOmie Family Dentistry, we see lots of patients each year with chipped, damaged or broken teeth. The good news is our skilled, professional dentists and our friendly trained staff, know exactly how to restore your smile. The right restorative or cosmetic dental treatment for your situation will depend on how severely your tooth or teeth are damaged. But, you do have several choices for getting your tooth and confidence in your smile back. How Do People Get Chipped, Cracked or Broken Teeth? Tooth enamel is the hardest substance in your body, but it can still be damaged, cracked or broken when you do things like mentioned above. In addition to trauma, cavities and tooth decay can also weaken your teeth over time and cause them to break when chewing hard food and using your teeth in ways you shouldn’t. As a dentist, we categorize broken teeth in many ways. The following will give you an idea of how we BREAK them down (Sorry I couldn’t resist the bad pun). These are small vertical cracks in your teeth. They can be caused by many things like chewing on ice or even an imbalanced bite. 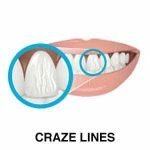 Craze lines are technically tiny cracks in your teeth, but they are not a major cause for concern like a crack that has penetrated deep into the tooth that causes real damage to your teeth. If you have a tooth with craze lines and its become sensitive, then it may be more than just a typical craze line and is developing into a real crack that needs attention. When a portion of a tooth’s chewing surface breaks off, usually around a filling, it’s known as a fractured cusp. 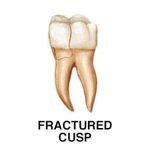 A fractured cusp usually, doesn’t cause much pain and rarely damages the pulp. We typically will put a new filling or crown over the damaged tooth to preserve it. When a crack stretches from the chewing surface vertically approaching the root, we refer to this as a cracked tooth. A broken tooth left untreated will only get worse and usually results in tooth loss. Early diagnosis and the proper treatment are essential in saving cracked teeth. A split tooth is what usually happens if you leave a cracked tooth untreated. Like a cracked tooth there is a crack, but it is split into two pieces by a crack that runs through the tooth. 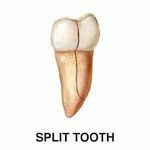 A split tooth involves damage to the root itself and depending on the size and location of the crack will ultimately determine if any part of the tooth can be saved, but typically it will need to be extracted. Dr. McOmie has been known to save these teeth with some amazing treatments. We always do our best to preserve a tooth whenever possible. These type of fractures are the worse scenario. This is when a tooth breaks straight down the root. Often it splits down the middle just like a piece of firewood. This is the one area of dentistry where there is not much that can be done and these teeth need to be extracted. Frequently these types of fractures are associated with a past endodontic treatment commonly called root canal therapy. 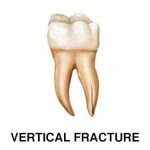 Sometimes a vertical root fracture can have few symptoms, and it is noticeable by changes in the gums being red or swollen. Other times the tooth hurts when the fracture occurs, but then only hurts when biting on it. These typically don’t throb and ache like an infected tooth does. 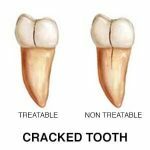 Now that you know a little more about what types of cracks exist in the world of dentistry lets discuss how best to treat these painful situations. The dentists at McOmie Family Dentistry can recommend which of the following treatments are right for you and your mouth. For smaller chips, we use tooth bonding to improve the cosmetic appearance and protect a chipped tooth. Bonding is a tooth-colored resin material which is applied and sculpted over the healthy area of the tooth to rebuild the tooth where the tooth was chipped. We first roughen up the remaining tooth enamel then place tooth bonding agent and desensitizer and then form the composite material to create a natural-looking addition. Then, a high-intensity curing light is used to harden the composite. Then we shape it to look natural and blend in color. Next, we polish it to make it blend in with the shine of a natural tooth. Bonding can usually be done in a single office visit and significantly improve the appearance of a tooth. Depending on the location and size of the chip, bonding can offer a good long term solution. However, because veneers are stronger and last longer, many people choose veneers over bonding. If your chipped tooth is more cosmetically serious in nature and you want a restoration that can last decades, then a dental veneer is the perfect solution. Veneers are essentially thin porcelain covers on the front of your teeth and produce a very appealing, natural look. At our dentist office, we use porcelain veneers because they deliver the most attractive and realistic results possible. Veneers have many advantages over other procedures, such as they are more conservative on the tooth structure than a crown. They are more color stable than bonding. A veneer is very strong and will last a quite a long time. Veneers done at McOmie Family Dentistry are done with the latest materials, materials that are well researched and proven but have the ability to provide a natural beautiful smile. We have master ceramists located in the USA fabricate our veneers using a layering technique that proves to provide natural strong, beautiful results. Veneers are the finest cosmetic solution for a chipped or broken tooth. But they can also be used to cover stained or misshapen teeth. Veneers are the gold standard of cosmetic dentistry and have a 40-year track record. To prepare the teeth for veneers, we first need to gently remove some of the existing tooth’s outer structure so we can avoid a significant unnatural final appearance. 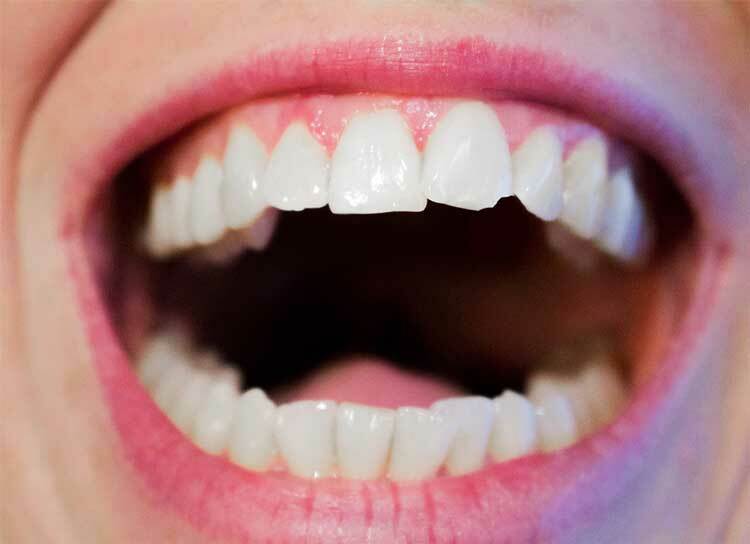 Many dentists still use old impressions process where you have to bite down on trays filled with gross tasting impression material, but we use a 3d digital scanner to get a highly accurate digital image of your teeth. Before sending to the lab to have your veneers created, we will discuss the size, shape, and shade of your veneer to best match your smile and overall desired appearance. We will place temporary veneers until the next appointment where we will remove the temporary veneers, and then bond the new veneers to the front of your teeth. This process usually takes about two weeks. If you have a badly chipped or cracked tooth or residual pain associated with eating or drinking, a crown may be just what you need. Crowns, are similar to veneers and are also tooth-colored covers for the teeth. The big difference between crowns and veneers is that a crown covers the entire tooth, while a veneer only covers the front part of the tooth. When a broken tooth causes a significant portion of tooth loss, we will typically use a crown instead of a veneer. Crowns can correct the shape of the tooth and help quickly restore your smile while preventing additional damage like tooth decay or exposed nerves. At our dental office, we create custom crowns for each patient made specifically to match the rest of your teeth using tooth-colored porcelain that looks completely natural and will last a very long time. In some cases, if we use a Bruxzir crown it can last a lifetime. Check out this video of a BruxZir crown hammer test. It is amazing how strong these crowns are. Patients are given anesthesia to make the procedure comfortable and pain-free. We then prepare the tooth by removing some of the existing tooth structure to make room for the crown. Once the tooth is ready, we will take a digital scan of your tooth and surrounding area, which will be sent to our lab and used to make the permanent crown. We will then provide a temporary crown so you can continue to eat and protect the area. When the permanent crown is ready, we will test fit and make any adjustments then cement the new crown in place. At McOmie Family Dentistry it usually takes one week to get the crown completed. In situations where you have a crack in your tooth that is extended into the pulp, root canal therapy is the best treatment option. Root canal treatment is an excellent way to relieve pain from an infected or inflamed tooth caused by a crack or chip in the tooth. When a root canal or endodontic treatment is performed, the infected or inflamed pulp is extracted, and the inside of the tooth is thoroughly cleaned, then filled and sealed with gutta-percha which is a rubber-like material. The tooth’s surface is then restored with a core build-up, and then a crown is done to protect it from breaking and restore normal tooth function. It is normal for our patients to be amazed at how easy a root canal is. There are bad stories abound about root canal therapy, that is not the case with modern dentistry. A root canal procedure normally lasts about 40 minutes start to finish, and that includes doing the crown. We pride ourselves in making a molehill out of a mountain. Most people think it is going to be hard and hurt; they are pleasantly surprised and happy they no longer hurt once we are done. If you have a tooth that has cracked just before or below the surface of the gum line, you will need to have the tooth removed and replaced with a dental implant. Of course, we could also do a bridge after extracting the tooth, but that will compromise the surrounding healthy teeth, so a dental implant is usually a much better option. Dental implants are a permanent replacement for your missing teeth. They are secured into your jawbone with a titanium post in the gumline, and then a dental crown is placed on top of the implant that looks and feels just like a real tooth. Dr. McOmie will surgically place biocompatible titanium implant into your jawbone which will act as the new root of your tooth. Although every patient is different, it can take up to 6 months for the jawbone to fuse with the titanium screws. This time allows for a durable, long lasting foundation. However, our average time from placing the implant to a completed procedure with a new crown is about two months. Sometimes in as little as two weeks. It all depends on the stability of the implant at placement time, which is determined by the density of the bone. The denser the bone, the more stable the implant. Once the bone has fused to the implant, we will take a digital scan of your teeth and the implant to have a custom crown made for your implant. About two weeks later the crown will be done for your implant. The crown will be attached to the implant and function just like a natural tooth. Most people that have had an implant procedure done at McOmie Family Dentistry can’t remember which tooth is the implant. They are natural looking and match the surrounding teeth. They look like the grew there. To possibly save your tooth, avoid more damage and potential infection, It’s important to see your dentist right away if you have a chipped or damaged tooth. Getting a chipped tooth is a pretty common dental issue, but there are several effective treatments available to fix the damage. Call McOmie Family Dentistry 423-899-1112 today and make an appointment to get your tooth repaired by our expert dental team.